Affordable Tree Trimming Escondido Residents can trust. 🌳20+ Years Experience in San Diego. 🌳Serving all of San Diego County. 🌳Industry’s Best Tree Trimming Techniques. 🌳We Will Leave Your Property Looking Better Than Ever. Rancho Bernardo, Fallbrook, Vista, Escondido, Tree Service Experts. Maintaining your property is hard work and when it comes to tree care sometimes doing all you need to do to make sure your trees are healthy and safe can seem like an overwhelming task. Finding the time and energy to handle these things is always hard and that’s why it’s best to find people skilled at handling tree treeing and let them figure out the best course of action when it comes to handling your trees. Finding skilled Escondido tree trimmers isn’t that hard as we are more than ready to deal with whatever issues you have with your trees. With years of experience, we’ve seen just about everything when it comes to trees and can work with you to give you quality service. We know you’re worried about tree trimming cost, but rest assured that handling an emergency now is far better than leaving a dangerous situation lingering around. Time is not on your side when it comes to trees damaged by storms. Having a team of experts come in and remove branches before they fall can save you thousands of dollars in property damage and even prevent possible lawsuits if your trees were to fall into a neighbor’s yard and cause damage to their estate. Don’t let a situation get out of hand just because you thought you could handle it yourself or that the situation would somehow resolve itself. We are tree trimmers Fallbrook, Vista, Escondido and Rancho Bernardo can trust and we can be reached seven days a week to help you handle whatever issues you have with your trees. Feel free to ask out experts anything about your trees and whatever issues you may think you need help with. We’re dedicated to helping people understand exactly what is happening with their trees and look forward to talking to you. Choosing the right Tree Trimmers in Vista, Fallbrook, Rancho Bernardo, and Escondido. Having your tree trimmed to make it look more beautiful is one of our most important services. You want your trees looking their best and we have decades of knowledge when it comes to doing exactly what needs to be done to make your trees look beautiful. We have knowledge of every time of tree on the west coast and will be able to do everything needed to make them look their absolute best. We’ll handle whatever amount of trimming your trees need. No job is too big or too small for us to handle and we’ll work tirelessly to give you the results you expect. The Tree Services You Need in Escondido, Rancho Bernardo, Fallbrook and Vista. So if you would like to have somebody visit your home and give you a no-obligation free estimate for help with your trees please give us a call. It can be anything from giving your trees a beautification trimming and working out a maintenance plan to keep them looking amazing All the way to having an emergency and need branches or a whole tree removed as quickly as possible. Whatever your needs are we are at the ready to help you find a solution. Rancho Bernardo Tree Care and Maintenance. Vista Tree Removal, chipping, and hauling. Whether you have a tree that is leaning over your home, walkway, driveway, pool or solar panels, Estates Tree Service will have the solution that you’re looking for, our highly skilled staff of tree trimmers have the knowledge and experience to care for any type of tree that you have on your property whether they are Palm trees, olive, ficus, eucalyptus, acacia, oak, pine, jacaranda or any other type of tree we have the experience required to provide affordable tree care for you. Additionally we over land and brush clearing services to protect your home from the dangers of wildfires, satisfy insurance requirements, and keep you safe. If you’re looking to have dead trees, branches or brush removed from your property the crew at Estates Tree Service can chip and haul away the debris for you which will not only improve the look and feel of your property it will decrease the dangers of wild fires. In the event that you have an emergency and you need your trees or land serviced right away we are proud to offer 24/7 Emergency service, Estates Tree Service is always available when our customers need us. Estates Tree Service, The expert Rancho Bernardo Tree Service, Removal, Trimming and Care professionals. Estates Tree Service has provided Fallbrook, Rancho Bernardo, Escondido, and Vista with the best value in professional tree care services, tree trimming and removal since 1992. 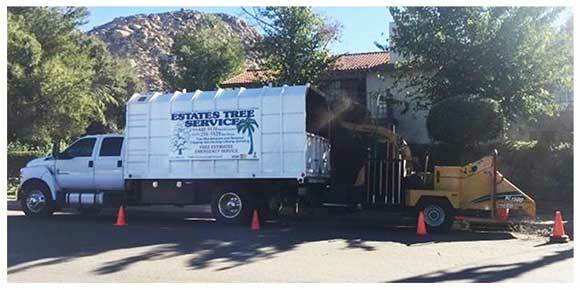 With our years of expert experience and commitment to ensuring our customers are 100% satisfied with each job we complete we have become the premier Tree Service company in Rancho Bernardo. Our expert staff is highly trained in the industries best practices of trimming, pruning, lacing and shaping trees for both residential and commercial clients, our staff is also fully trained in stump removal, stump grinding, palm tree trimming and care, crown raising, crown reduction, brush clearing, and more. We have served thousands of wonderful clients throughout the entire county of San Diego and we have earned a BBB A+ rating along with hundreds of great reviews on Yelp, HomeAdvisor, Facebook and Angie’s List. Our superior service makes Estates Tree Service the best choice in Rancho Bernardo, Vista, Fallbrook, Escondido, we will leave your property looking better, safer and completely mess free after we complete our service. As a licensed and insured Tree care company we take the safety of your home seriously and with our low rates we will make your wallet happy. Free Fallbrook Tree Service Estimates, also available in Rancho Bernardo, Vista, Escondido and the rest of San Diego County. We offer 100% free, no obligation estimates, while other Tree Service providers may try to lock you in on the spot or refuse to give a written estimate Estates Tree Service is proud to be upfront and clear with our pricing, we know that most homeowners will shop around and we are confident that we will win your business. 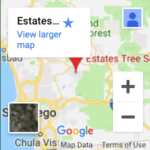 Additionally, our expert service speaks for itself, take a look at the hundreds of happy reviews that we have received and you will city why Estates Tree Service is the right choice in Escondido, Rancho Bernardo, Fallbrook and Vista. Is your neighborhood missing from this list? Don't Worry! We provide our high quality & affordable services throughout the entire County. Contact us today for your FREE estimate.